Members of the Kosovo Security Force stand at attention during the Kosovar president’s visit to the Adem Jashari barracks in Pristina on December 13. History is repeating itself in the Balkans. 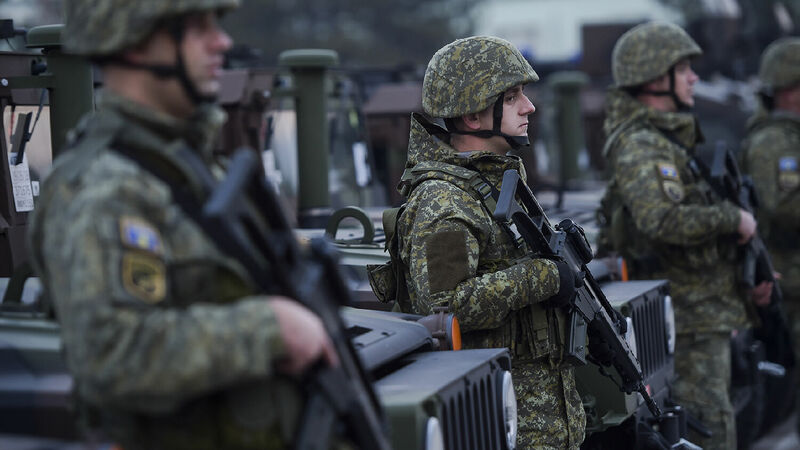 After a unanimous vote by its legislature on December 14, Kosovo is planning to establish its own military. The decision has angered Serbia and is strongly opposed by the United Nations. But in a rare show of opposition toward the UN, Germany has stated that it supports the creation of the army, as has the United States, Britain, France and Turkey. The United States has donated 27 Humvees to the future Kosovar Army, which will also purchase 24 multifunction combat vehicles from U.S. manufacturer AM General. The establishment of a Kosovar military, which Kosovo claims is backed by nato, was rejected by nato Secretary General Jens Stoltenberg as “ill-timed.” The formation of an army violates the UN resolution reached at the end of the Balkan War in 1999. Under that resolution, the UN deployed a peacekeeping force in the Balkans, which has dwindled to only 4,000 soldiers. Serbians immediately rejected the idea of a Kosovar army. The 11 ethnically Serbian members of Kosovo’s parliament boycotted the vote. The decision is another provocation against Serbia after Kosovo recently implemented a 100 percent tariff on Serbian imports. The Serbian government even mentioned the option of an invasion, citing the presence of a Serbian minority group in Kosovo as justification. But this is unlikely at present. To understand what is happening in the Balkans right now, and what the outcome will be, we must look at this region’s volatile history. The Balkans are a critical part of Europe to watch, just two decades on from the last major war on the Continent. That war is the clearest example of Germany aggressively pursuing its own interests against the rest of the world. For most of the 20th century, Kosovo was part of Yugoslavia. In the 1990s, when Kosovars were pushing for independence, all of the world’s major powers rejected the move, since it would immediately spark a war and break up Yugoslavia. But a united Yugoslavia had the potential to be a serious European power opposed to German interests. Germany pushed hard for breaking up Yugoslavia, and the opposing nations backed down. In fact, all 29 nato nations, except Greece, ended up contributing to the war effort against Yugoslavia. At the insistence of German Chancellor Gerhard Schröder in 1999, nato began air strikes against Yugoslavia without a UN mandate, in support of Kosovo’s independence. Now Germany is again going against the UN and supporting Kosovo in its militarization. And again other countries that were allied with the Serbs against Germany in World War ii, such as the U.S., are now abandoning and opposing them. Why should the rest of the world be concerned about the formation of a tiny army in a small nation? Germany’s support for Kosovo’s militarization and its further independence from Serbia proves that German ambitions for the Baltic region are still active. In a remarkable process, aided and encouraged by other nations, the Germans neutralized a former enemy and gained an area to test and build their military—relatively unnoticed by the world! At the same time, the second leg, or foot (Eastern Europe), of the empire is developing! Few people recognized the significance of these events as they were happening. But because we understood the prophetic overview, we have been reporting on them all along. Now, with Germany’s power over Europe all the more obvious, the true nature of this dramatic history is impossible to ignore! How could anyone be so sure about the outcome of a complex situation like the Balkans? The answer lies in the pages of your Bible. Trumpet readers are familiar with the prophecies that show Germany will lead the next resurrection of the Holy Roman Empire—another repetitive historical trend. The last and most deadly resurrection of that historically violent empire is beginning right now. To see more about how this will change the world you live in, watch Gerald Flurry’s recent Key of David episode “The Prophesied Holy Roman Empire Has Arrived.” Also order your free copy of Germany’s Conquest of the Balkans.